No time to write blog posts? Put your brilliance in your blog. 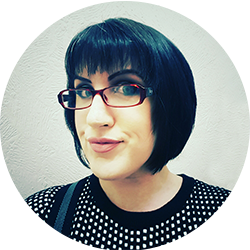 I’m a Newcastle-based photography-loving, Red Dwarf-quoting, horror-watching blogger and copywriter. “Frankly my dear…I don’t give a damn”. What do all of the above have in common? Yep, they’re lines from movies. Also known as dialogue. Or – and this is more useful to you – conversation. Your blog is your chance to start a conversation with your followers or students. Sure, maybe they saw a livestream on Instagram and thought you were the best thing since Alexander Graham Bell picked up the telephone and dialled the first wrong number. Or perhaps they did your free 5-day Facebook challenge and now they want to buy your course. But what about the people who haven’t met you on social media and don’t know who you are? They will – because you’re going to have an epic blog. And you know you need a blog. People need to keep seeing your brand name before it sticks in their brain. They’re an awesome way to get all of that fantastic know-how out of your head and onto the internet where Google can find it (sorry, Facebook Live, you’re just not searchable). So you’ve probably even tried to get a blog started. But between developing your course or coaching program and finding students, your blog keeps sliding down your ‘to do’ list. So why work with me? I’ve been a published creative storyteller since 2008 so I know how to connect through story and other conversational content. I’ve built up my own blog to support my fiction career because no matter what platforms come and go, blogging remains the best way to reach new readers – and turn them into fans, students, and followers. Or, if you prefer, friends you haven’t met yet. LJ’s content and copywriting knowledge really helped me correlate my website into a cohesive message that is easy for potential clients to follow. With just a few suggestions from her, I was able to bring my message to the forefront while still obtaining my authentic voice. I highly recommend her! Why did I choose to help course creators and coaches? I’m a passionate advocate for self-development, and as a teacher of over seven years, I’ve seen firsthand the personal changes that good education can make in a person’s life. There’s nothing quite like that moment when you see the penny drop. And that student walks out of your studio holding themselves taller because they’re more confident than they were before they met you. I’m a qualified teacher, so I can help you put your curriculum together based on sound educational psychology principles. I’ve also taught advertising so all that lovely psychology and selling stuff won’t go to waste. But I’m an ethical word wizard so I promise to only use my powers for good. LJ is an excellent writer who always delivers top-notch content and routinely exceeds deadlines. There were never any issues contacting her (me being in North America and her in the UK) and she’s so dedicated she even came home early from an anniversary dinner to take on and deliver a last minute project! I would highly recommend her writing services to anyone who needs actionable and engaging and content for their business. If you’re running an online course, you may need help creating learning materials. Tutorials, how-to guides, or even a course e-book. Why not take advantage of my experience in writing step-by-step graphic design tutorials and let me write them for you? LJ makes writing for the web seem effortless. She has a very shareable and engaging style and a fantastic understanding of blogging, social media, technology and marketing that all work together to deliver incredible value to her clients. I’d been looking for a long time for a content writer I was happy with to supplement my own work, and I’m so glad I found LJ! Click here to let me jumpstart your blog! I help coaches and course creators connect with new audiences by writing in-depth blog posts and course content!